Okay. First, a confession. For some reason I have found this a very difficult article to write. I saw AGOKWE ages ago, and have been turning the show over and over in my head since then. The main problem is that I can’t actually figure out what I think of the show. Here’s what I do know… I am glad I saw the show. There are some stunning moments in this show. And, this can’t have been an easy show to write and perform for Waawaate Fobister, in fact, the whole thing felt pretty brave. Why brave? Well, I wondered out loud to Lisa, who accompanied me to the show, whether this would be harder to do in front of a First Nations audience, or a non-First Nations audience (which, in the Toronto theatre scene usually translates to white). But Fobister did this in Toronto, so it will be in front of both, since I seem to remember being told that Toronto has the highest population of First Nations people in Canada. Also, I always figure that it’s pretty brave to expose yourself and your experiences on stage, in a way that is explicitly stated that it is autobiographical. Especially if you’re the one up on stage performing it. 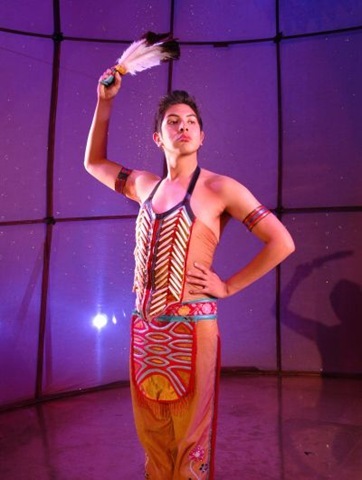 And, this is the first coming-out story of a young aboriginal that I’ve heard, or, even hear of being put on stage. Now, as for the production. Lisa and I both agreed that the staging was quite beautiful, and there was excellent usage of multimedia – it actually enhanced the show, and did not feel like ‘hey, look at these cool things we can do with a projector’ which is, unfortunately, often how multimedia comes across these days. Walking into the theatre you’re greeted with the smell of sweet grass burning, which is a nice touch in terms of setting a mood. Unfortunately there was way too much usage of fog machines for me. In the beginning you couldn’t see through the fog to the performance, and every time the theatre filled with fog I felt like I was going to choke. So, I’d like to see more judicious use of the fog, just enough to set a mood, imply fog, instead of actually obscuring the view and chocking the audience. Lisa also really liked how the show played out, her comment was “that was one of the best performances I’ve seen by someone wearing assless chaps.” She liked the range of characters played by Fobister, feeling that the character Betty Moses was the most ‘real’ character of anyone on stage. I tend to agree with that, which is ironic, since Jake is the character based on Fobister himself, but sometimes it’s harder to play yourself than someone else. For me there was something lacking. I can’t put my finger on it. There was something in the piece that lacked maturity. Something in the performance that lacked maturity. I think maybe what I feel like is that this play has reached the maturity equivalent of a teenager, and that although it is about a teenager, it needs to be more developed. I can’t help but think it didn’t live up to it’s potential. But, all that means is that the show can grow and develop, improve with work-shopping, that kind of thing. Because, I really do think it’s an important story to tell. The one thing that got under both Lisa and my skin was the didactic feel of the play. The moralistic introduction, we could handle that, but the end, where we were being asked if we ‘got it’ repeatedly felt condescending and overdone to us. I think it’s important to trust your audience, let them be free to draw conclusions, rather than force-feed them a message. So, as you can see, I’m not particularly clear on my overall feelings on this one. I think bottom line is that it has huge potential, it’s a brave and important story. I was glad to see it and would recommend it to folks, but I look forward to seeing it in the future after it’s been developed a bit more fully.